Explore & Restore Waihe’e Refuge was a perfect activity to explore what Maui, Hawaii was all about before modernization. The directions to get there were very easy to follow. The volunteer coordinator was also very helpful in getting you to the right place. All of the volunteers were really friendly and seemed to be regulars at this activity weekly. The other organization that travel2change was partnered with was the Hawaiian Islands Land Trust. Their main goal is to protect the land that sustains us. We got right into work and rode the mule to sacred grounds and shoveled up some nice soil to pot Lauhala trees. 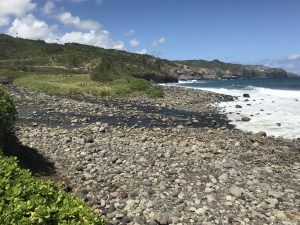 The area of this activity was on acres of land, in which they are trying to grow native Hawaiian plants on to bring back sustainability of the land. The soil was very thick and clay like and it was what we used to pot many small lauhala trees into bigger pots. The next step for them will be, to plant the trees into the ground. I do not think I have ever potted so many plants before. However, knowing that these plants will grow on the island of Maui in Waihe’e made it worth it. I want to also be able to preserve the Hawaiian culture and plants. While potting the trees, we also came across many friendly creatures, such as peacocks, tiny frogs, spiders, and chickens. The air was also so fresh and clean it was almost relaxing even though we were working. After potting all the Lauhala trees we were able to all get onto the mule and explore more of the acres of land. We passed a Hawaiian Heiau which is a sacred place that use to be used as sacrifice in the old Hawaiian days. The volunteer coordinator was also very knowledgable about the history of Hawaii and the area we were in so I also was able to learn a lot of interesting facts about the land. When we got to the shoreline, the view was amazing. I think Maui has the prettiest views and this spot was definitely breathtaking. We also got to go into the river that once connected to four other waters. To experience the real Hawaiian culture and history, I would 10/10 recommend this activity. In fact, I will probably sign up again when I am back on Maui. The views, experience, and the river was worth the work. Book the activity now ! !